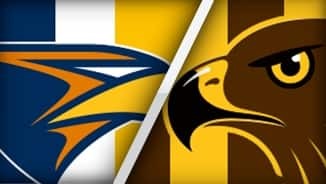 Hawthorn finished with 74 turnovers for the match, its second highest tally all season, from which the Eagles scored 10.9.69, its third highest score conceded. The Eagles only had 53 turnovers for the match, from which the Hawks scored 7.6.48. 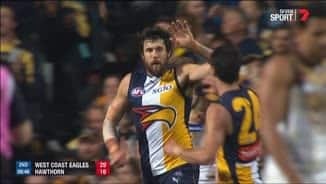 A comprehensive victory from the Eagles on the back of winning the contested ball and more efficient ball use. West Coast won contested possession by eight and went at 63 per cent by foot, limiting Hawthorn to 58 per cent, 10 per cent below its average. The Eagles have outscored 10.9.69 to 6.5.41 from turnovers. This represents the equalsixth best score from turnover chains all season for the Eagles and the fourth-worst score for the Hawks from this score source. Hawthorn's last two goals have come from clearances, now giving them 2.4.16 for the the match from this score source, equaling it's previous lowest total from this score source for the season. Hawks InterchangeJack Gunston and is possibly out for the game. Hawthorn has kicked the first three goals of the final quarter, all launched from the attacking midfield zone. Two goals have come from intercept possessions and one from a stoppage, its first from this score source for the match. It's all Hawthorn in the final quarter, leading uncontested possession 28 to seven, inside 50s four to zero and kicking the first two goals of the quarter. Hawthorn are making one last effort, leading uncontested possession 17 to four and clearances three to zero to start the final quarter. After being outscored by 20 points from clearance chains in the corresponding Round 19 encounter, the Eagles have limited Hawthorn to 0.4.4 from clearances, scoring 3.3.21 themselves. The Eagles have scored 9.8.62 from 57 Hawthorn turnovers, with the Hawks scoring just 4.5.29 from 38 West Coast turnovers. Since quarter time the Eagles have won contested possession 77 to 65, disposals 186 to 146 and inside 50s 32 to 19, kicking at an efficiency of 63 per cent to the Hawks 55 per cent, scoring 10.9.69 to 2.6.18 over the time period. West Coast has outscored Hawthorn 3.3.21 to 0.4.4 from clearances. The Hawks average 41 points per game from clearances, ranked second, with 16 points against in Round 14 its lowest score from this source this season. Both of West Coast's goals this quarter have been launched from intercept possessions in its attacking midfield zone. In total, the Eagles have launched 12 chains from opposition turnovers in the attacking midfield zone for 10 inside 50s and 3.4.22. All four of Hawthorn's goals for the match have come from intercept possessions in the defensive midfield zone. In total, the Hawks have forced 16 turnovers in this zone, resulting in five inside 50s and 4.1.25 on the scoreboard. Very much a turnover game in the third quarter, Hawthorn kicking its entire score of 1.3.9 from turnovers and West Coast kicking its entire score of 1.1.7 from this score source. Hawthorn is leading the clearances five to one this quarter. Sam Mitchell has three of them. Hawthorn have started the third term well, leading contested possession eight to three, uncontested possession seven to one and clearances two to nil. This season, the Eagles average 33 points per game from chains launched in the defensive half, ranked 10th. Already tonight, West Coast has scored 4.2.26 from chains launched in its defensive half. 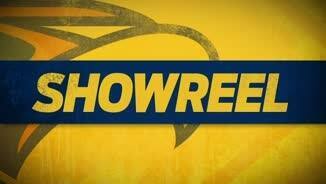 Hawthorn has been the best kicking team this season, going at a kicking efficiency of 69 per cent for the year. In the second quarter the Hawks went at just 49 per cent by foot, compared to the Eagles' 62 per cent. After losing nine of the first 10 clearances of the quarter, the Eagles have won eight of the next 13 clearances. Despite trailing the clearances 27 to 20, the Eagles have outscored the Hawks 2.1.13 to 0.3.3 from clearances for the match. Luke Shuey has been enormous in the contest this quarter with nine disposals at 78 per cent efficiency, seven coming via a contested possession, and three clearances for the quarter. West Coast has now kicked 4.3.27 to 0.0.0 from opposition turnovers this quarter. Two of their goals have been launched from defensive 50, with three of the four goals being launched from the defensive half of the ground. Coleman Medalist Josh Kennedy has three of West Coast's four goals this quarter. Kennedy has seven disposals and a gamehigh seven marks, three more than anyone else on ground. He has four marks inside forward 50, Hawthorn has one. West Coast has outscored Hawthorn 3.2.20 to 0.0.0 from turnovers this quarter, with 2.2.14 being launched from behind centre. The clearances are now nine to one in Hawthorn's favour this quarter and 21 to 12 for the match. Despite this, the Eagles have outscored the Hawks 1.0.6 to 0.3.3 from this score source for the match. The Eagles have kicked the first two goals of the quarter, both of them coming from opposition turnovers in the midfield. The Eagles have outscored the Hawks 3.3.21 to 2.1.13 from this score source so far. The Hawks have won the first five clearances of the second quarter, including two centre bounce clearances. They now lead centre clearances six to zero for the match, and total clearances 17 to 11. Five goals in total have been scored for the match, two of which have come as a result of 50m penaltiesone to the Hawks and now one to the Eagles. With the first centre bounce clearance of the second quarter going Hawthorn's way, the Hawks have now won all five centre bounce clearances for the match. All in all, a very even first quarter, as evidenced by the one point lead to the Hawks. Hawthorn leads contested possession by one, clearances by one with inside 50s level at 11 apiece and kicking efficiency all square at 65 per cent for both teams. Hawthorn is enjoying territorial dominance in the last 10 minutes enjoying 73 per cent time in forward half, controlling the football with 23 uncontested possessions to eight over the time period. Sam Mitchell is now up to a game high 11 disposals, with nine coming via an uncontested possession. Despite this, he is only going at a disposal efficiency of 55 per cent. Now Rioli has nine disposals at 78 per cent efficiency, his highest disposal tally in any game this season. Rioli also leads the Hawks with three tackles. Cyril Rioli boots Hawthorn's second goal with his eighth disposal of the quarter, equaling his highest disposal tally in any quarter this season. Josh Hill from the Eagles kicks the first goal of the match as a result of an intercept possession inside forward 50. The Eagles average 23 points per game from chains launched inside forward 50, ranked No.1 in the competition. The Eagles have six of the first eight inside 50s of the match, enjoying 66 per cent time in forward half so far. West Coast are narrowly on top in contested possession early, leading 12 to eight. All three of Nic Naitanui's disposals have come via a contested possession, with Josh Kennedy also taking two contested marks. Sam Mitchell has five disposals already, but is going at just 40 per cent efficiency. In Round 19 against the Eagles, Mitchell led all comers with 36 disposals at 67 per cent efficiency. In Round 19, Hawthorn won the tackle count against the Eagles by 33, its largest differential this season. The Hawks average four more tackles per game than their opposition, ranked ninth, with the Eagles averaging 15 fewer tackles per game, ranked 18th. When the two sides met in Round 19, one key to Hawthorn's victory was at the stoppages. The Hawks won the clearance battle by 13 and outscored the Eagles by 20 points from this score source. 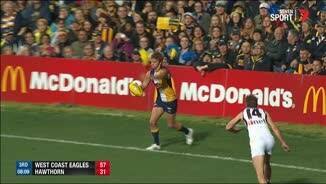 Nic Naitanui didn't play for the Eagles in this encounter. The Eagles have won the contested possession count 16 times this season, not losing a game when this happens. However, on the six occasions when they have failed to win the contested possession count, the Eagles have lost five of these six games. Tonight's match features the two sides that score the most points per game from opposition turnovers. The Hawks average 67 points per game from this score source, ranked No.1, while the Eagles average 59 points per game, ranked second. Welcome to Domain Stadium for the West Coast Eagles v Hawthorn Round 1 clash. WEST Coast has stormed into its first home preliminary final since 2005 with a stunning 32-point qualifying final win over Hawthorn at Domain Stadium on Friday night. The Eagles came in undermanned after losing Matt Priddis (thigh) before the match, but overwhelmed the reigning premiers with suffocating pressure to win 14.12 (96) to 9.10 (64), leaving the Hawks facing a preliminary final in Perth against minor premiers Fremantle or in Sydney against the Swans as they chase a third straight premiership. 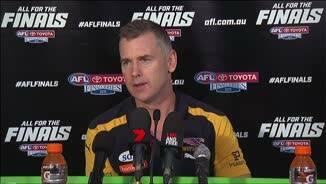 "I'm really proud of the players," Eagles coach Adam Simpson said post-match. "Obviously losing 'Pridda' (Matt Priddis) before the game was really difficult for him. "And playing against the Hawks at almost full strength – I'm really proud of the players." The Hawks will play the winner of Saturday night's elimination final between the Western Bulldogs and Adelaide in a semi-final next Friday night. To add injury to insult for the Hawks, Jack Gunston was carried off in the last quarter after buckling awkwardly on his right leg. The Hawks' leading goalkicker this season will face a race against time to be ready for next Friday night. "I think it's an ankle," Hawks coach Alastair Clarkson said post-match. "But we'll get that scanned throughout the course of the week and see what the severity is. "It didn't look great and he obviously couldn't come back onto the ground. But it was late in the game anyway so we weren't going to take the risk." The Eagles suffered a huge blow prior to the game with Brownlow medallist Priddis ruled out, Patrick McGinnity replacing him in the selected side. Their injury woes didn't stop there, Jeremy McGovern missing most of the first term after leaving the ground clutching at his left shoulder, but he returned in the second term to play out the match. "They'll be fine," Simpson said. "But we've got a lot of sore players though, so we're going to need the break to recuperate." The Hawks dominated the clearances (50-40) and the centre clearances (15-8) in Priddis' absence, but they were beaten emphatically in general play. Priddis now has two weeks to recover for the home preliminary final, as will fellow midfielder Chris Masten. The Hawks could not get through the Eagles' pressure. They turned the ball over regularly and then got burnt on counter-attack. The Eagles had 50 inside 50s to 40, and took 17 marks inside 50 to 10. 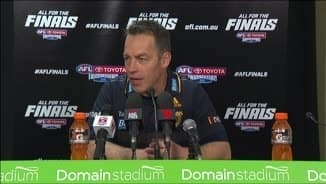 "Just the little half chances that we had, especially throughout the course of the first half, fumbled balls, missed kicks, missed handballs, which was just so unlike us," Clarkson said. "We'll back our boys in and go again. Luke Shuey was outstanding with 25 disposals, 11 contested. Nic Naitanui monstered the Hawks' rucks, particularly after half-time with 40 hit-outs and 12 contested possessions. 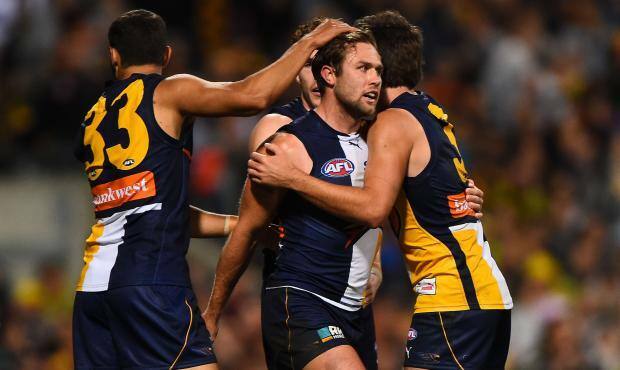 Josh Kennedy kicked three goals, but could have finished with a bag after taking nine marks. Shannon Hurn was pivotal with 26 disposals off half-back. Sam Mitchell played a lone hand for the Hawks with 35 disposals and 10 clearances. Luke Hodge finished with 29 disposals and a goal, 20 in the second half. Cyril Rioli (21 and a goal) was dangerous all night, while Jarryd Roughead and Shaun Burgoyne finished with two goals each. The Eagles set up the win with a stunning second term. They turned a one-point quarter-time deficit into a 32-point advantage at half-time, kicking 5.4 to one point in the quarter. They had 11 more possessions for the quarter, eight more contested possessions, 12 more marks and eight more inside 50s as Hawthorn didn't score after the six-minute mark. Shuey collected 11 disposals for the quarter, eight contested, while Kennedy kicked three goals to all but end the fight at the halfway mark of the night. The Hawks won the clearances by eight for the quarter and led the centre clearances 8-2 at half-time, but were placed under so much pressure with ball in hand that they kicked at 49 per cent for the quarter. The Eagles pressed on in the third term, with Naitanui taking over when David Hale was subbed out. 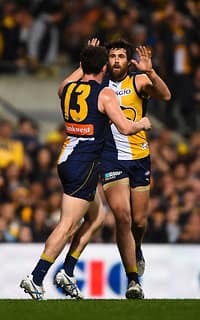 The final four goals of the quarter, two from Jamie Cripps, saw the Eagles lead by 50 points at three-quarter time before the Hawks salvaged some pride with a five-goal to two last quarter.